As island nations around the world look for solutions to stem rising sea levels due to climate change, a new land mass has spontaneously popped out of the Red Sea. The smoking hot island is acting as a real-time geographical lesson in how volcanic oceanic islands are formed — it is bubbling above the surface due to a recently active volcano. 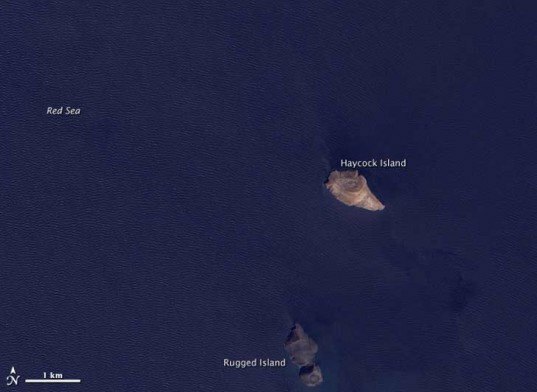 NASA captured the rising island (shown above) from their Moderate Resolution Imaging Spectroradiometer (MODIS) – check out an image of the spot before the volcanic eruption after the jump. A volcanic eruption occurred earlier this month between Haycock Island and Rugged Island in the Red Sea off the western coast of Yemen. On December 19th, fishermen in the area reported seeing lava fountains reaching up to 90 feet tall sprouting out of the water. By December 23rd, when MODIS took the photograph at the top of this story, a small island appeared to be rising out of the ocean. The new island has risen as a part of the Zubair Group – a line of islands rising out of an underwater shield volcano that is part of the Red Sea Rift, where the African and Arabian tectonic plates pull apart. Perhaps as all the low-lying islands around the world that are currently threatened by rising sea levels disappear we can look forward to Earth building new ones with oceanic volcanic eruptions. As island nations around the world look for solutions to stem rising sea levels due to climate change, a new land mass has spontaneously popped out of the Red Sea. The smoking hot island is acting as a real-time geographical lesson in how volcanic oceanic islands are formed -- it is bubbling above the surface due to a recently active volcano. NASA captured the rising island (shown above) from their Moderate Resolution Imaging Spectroradiometer (MODIS) - check out an image of the spot before the volcanic eruption after the jump.